Construction of the large space telescope that is next in the Hubble Telescope lineage reached two major milestones last week. 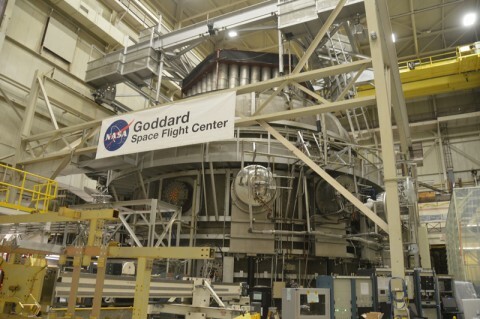 Scientists and technicians at NASA Goddard Space Flight Center in Greenbelt, Md., installed and aligned the last of the 18 hexagonal segments of the infrared telescope’s primary mirror, and they successfully completed a series of cryogenic tests on the telescope’s instrument package. “For me, it finally looks like a telescope. It’s so exciting to see the mirrors come together,” Straughn said. “We have been, for years and years, leading up to this point of putting the [mirror] pieces together,” Amber Straughn, an astrophysicist and deputy project scientist for science communications, said at a 29 January presentation at Goddard, where the mirror has been assembled and where the main instruments of the James Webb Space Telescope (JWST) have undergone exacting testing for the frigid space environment. Scheduled to launch in October 2018, JWST will orbit the Sun at the second Lagrange point, or L2, a location 1.5 million kilometers away from Earth that will allow the observatory to stay in a fixed position relative to Earth and the Sun. ”For me, it finally looks like a telescope. It’s so exciting to see the mirrors come together,” Straughn said. “Hubble has changed the way we understand the universe, and it has driven a lot of the science that we are planning to do” with JWST, explained Straughn. She added that the new telescope will be “about 100 times more powerful” than the Hubble Telescope, thanks to JWST’s tennis court–sized mirror, the infrared wavelength range it will observe, and the efficiency of its set of instruments. JWST “is going to completely revolutionize our understanding of exoplanets”—those distant planets that orbit stars other than our Sun—by helping scientists learn more about their atmospheres, she said. JWST, which is an international project led by NASA with major contributions from the European Space Agency and Canadian Space Agency, could also observe the outer planets in our own solar system. However, the telescope’s mirrors and instruments must point away from the Sun and Earth, which are large infrared sources that could “fry the detectors,” she added. JWST will also peer with infrared vision “beyond the veil of galaxies we see with Hubble,” Straughn said. The telescope will scrutinize parts of the universe 13.5 billion light years away and therefore see them as they were that many billions of years ago. By looking back to almost the beginning of the universe, researchers hope to learn about the first stars and galaxies to appear after the big bang. Scientists also anticipate that the observatory will help them better understand the evolution of galaxies, mysteries of star formation, and the birth of planetary systems, Straughn said, noting some of the observatory’s science themes. 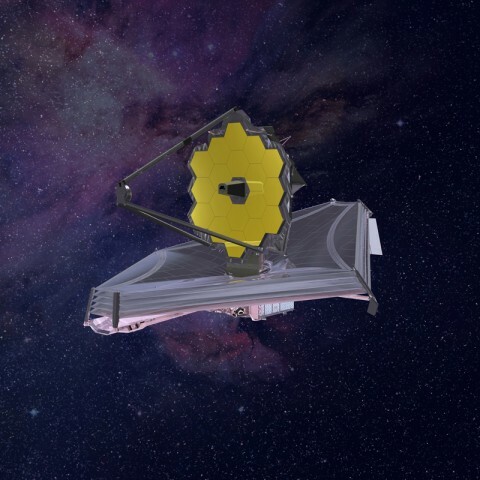 JWST, formerly known as the Next Generation Space Telescope, ranked as the top priority of the astronomical community in the 2000 National Academy of Sciences decadal survey for astronomy and astrophysics. Its instrument suite includes JWST’s primary imager, a near-infrared camera that covers infrared wavelengths from 0.6 to 5 micrometers. This camera can detect light from the earliest stars and galaxies, stars in nearby galaxies, young stars in the Milky Way, and Kuiper Belt objects. The instrument suite also includes a near-infrared spectrograph, covering the same wavelength range as the near-infrared camera; a midinfrared instrument, with a camera and spectrograph, covering the wavelength range of 5 to 28 micrometers; and a near-infrared imager and slitless spectrograph, with a wavelength range of 0.8 to 5.0 micrometers. Those instruments currently sit inside a space environment simulator facility at Goddard, a thermal vacuum chamber where scientists and engineers tested them by lowering the temperature to 42 kelvins and below. JWST project manager Bill Ochs said that with the tests concluded, temperatures inside the cryogenic chamber are gradually rising and the instruments should be removed from there in late February. While that testing took place, scientists and technicians in another Goddard facility donned white “bunny suits” to work inside a massive clean room to assemble the telescope’s primary mirror. Eighteen gold-coated beryllium hexagonal segments make up the mirror, which spans about 6.5 meters, 2.7 times the diameter of Hubble’s mirror. Each of the mirror’s segments, which are currently protected from dust by black carbon composite covers, weighs about 40 kilograms. Citation: Showstack, R. (2016), Final mirror segment added to powerful future space observatory, Eos, 97,doi:10.1029/2016EO045723. Published on 8 February 2016.